Escrow.com is gearing up to sponsor the 4th annual O.C. Supports Our Troops Charity Golf Tournament that is coming up in November. The tournament will be held at the Coto De Caza Golf & Racquet Club on November 9th, 2015. 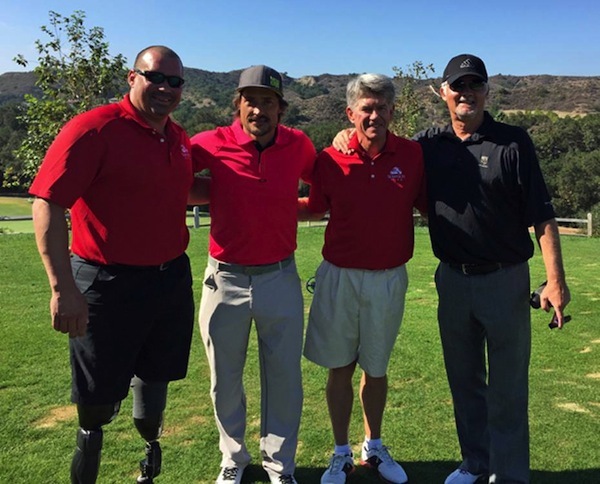 The annual golf tournament raises funds for the non-profit Orange County Supports Our Troops organization. According to Escrow.com President Brandon Abbey, last year’s “golf tournament raised $190,000 and received matching funds from the Bob and Renee Parsons Foundation” (Bob Parsons founded GoDaddy). If you are interested in participating in the tournament, there are still spots open. The cost is $600 for single golfers ($2,400 for a foursome), and Brandon Abbey let me know if you reach out to him, he will offer a $200 “friends of Escrow.com” discount. Tickets for the tournament closing dinner are $150, and dinner is included for the golfers who are participating. Registration for the tournament closes on October 27th. Pictured above at last year’s golf tournament is Master Sgt. Davey Lind, Teemu Selanne, Brandon Abbey and Rick Booth. Davey is this year’s keynote speaker at the dinner held prior to the tournament. Davey lost both legs at the knee after a roadside bomb exploded during night combat operations in the Al-Anbar province of Iraq in June 2007. The tournament benefits brave soldiers like Davey. I like hearing about companies giving back to their communities, and it is nice to see Escrow.com sponsoring this event.